You may have seen in my recent drugstore beauty haul post that I picked up the Garnier Skin Active Oil Infused Micellar Water (if you haven't seen my haul post but would like to, you can read that post here) when I posted my haul so many of you wanted to know my thoughts on the micellar water, I have now been using it for a couple of weeks and today am going to share my thoughts with you. I tried the original Garnier micelllar water with the pink lid last year and I absolutely hated it, it stung my eyes and I had to use so many cotton pads to remove my makeup and had to scrub at my eyes to remove my mascara, it really was awful. Recently I saw the oil infused Garnier micellar water on the lovely Ionna's blog and it sounded like it would be good for my super dry skin so I thought I would look into it and when I was placing a Boots order it was on offer for £5.99 or 2 bottles for £7.00 so I took advantage of the offer and ordered 2. The oil infused Garnier micellar water is suitable for dry and sensitive skin and claims to remove all makeup, even waterproof makeup, it claims to cleanse and nourish the skin, containing micelles which are cleansing agents to capture impurities and lift away the dirt from the skin and oil to dissolve all types of makeup, it is both dermatologically and opthalmologically tested. The micellar water is a bi phase product meaning you need to shake it before use to mix the products together, you apply it to a cotton pad and sweep it across your face to remove your makeup, it is non greasy and there is no need for rinsing. Considering I hated the original, I absolutely love this! It's so different, it doesn't sting my eyes and I don't need to use countless cotton pads when removing my makeup, my makeup is removed effortlessly and my skin is left feeling soft and smooth and not greasy at all, there isn't any kind of film left on my skin at all. I have both dry and sensitive skin and also suffer from eczema and I have had no problems at all when using this, I apply it to a cotton pad and sweep it across my face and it removes my makeup effortlessly without the need for rubbing, my daughter also uses it to remove her makeup and she loves it too, she wears a full face of make up most days and has no trouble removing it. I like to take my makeup off before I use my balm cleanser and this does the job brilliantly, removing every trace of makeup and leaving my skin soft and smooth, I am so pleased I picked this up and even more pleased I took advantage of the offer and bought 2 as I now have a backup. I highly recommend this product, it does exactly what it says on the tin and I love it, my skin feels lovely and soft after I've used it and it is incredible at removing makeup, I can't recommend it highly enough especially if like me you suffer from dry and dehydrated skin, it really is a brilliant product and one I will definitely re purchase. You can find the Garnier Skin Active Oil Infused Micellar Water on the Boots website HERE or the Superdrug website HERE, it is currently on offer on both the Boots and Superdrug websites for £3.99 (was £5.99) for 400ml. 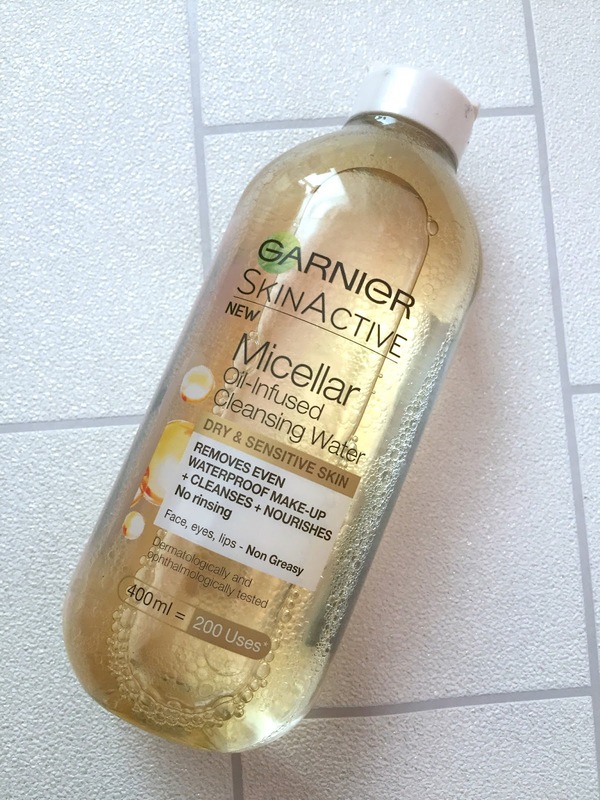 Have you tried the Garnier oil infused micellar water? Do you love it as much as I do? Chat with me in the comments and let me know your thoughts.